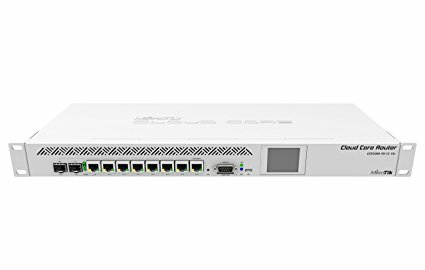 The MikroTik Cloud Core CCR1009-7G-1S-1S+ when unboxing, comes in a 1U rackmount case with 7x Gigabit ethernet ports and one SFP cage, with a 1Gbit software interface. This is the first Mikrotik Routerboard device that supports 100BASE-LX/100BASE-SX/100BASE-BX fiber modules, as well as standard 1.25G SFP module. If you are looking a router that will send many packets per second on an affordable budget then- Cloud Core Router with 9 cores is your best choice. Combo-port – a single 1Gbit software interface that has two hardware interfaces – a SFP cage and a Gigabit Ethernet port, allowing you to use any type of connection available to you. Port also allows to switch from one to another interface from software, or in event of disconnect, providing new, unique hardware fail-over feature. 100Mbps SFP support – this is the first device that supports 100BASE-LX/100BASE-SX/100BASE-BX fiber modules, as well as standard 1.25G SFP modules. More throughput – due to how ports are connected to CPU, new CCR1009 models can achieve higher theoretical throughput. The mikrotik CCR1009-8G-1S-1S+ has its 2GB of DDR3 800MHz RAM soldered directly to the motherboard and cannot be expanded. A simple guide to when next your buying a router.